VATICAN CITY (CNS) — Moral and ethical concerns must guide medical research so it will always be at the service of protecting human life and dignity, Pope Francis said. In that way, education and research can strive “to serve higher values, such as solidarity, generosity, magnanimity, sharing of knowledge, respect for human life, and fraternal and selfless love,” he said April 29, during an audience with people taking part in a conference on adult stem cell research. U.S. Vice President Joe Biden was in attendance and had addressed the conference with a 29-minute speech on the need to invest in prevention, access and affordability in the fight against cancer. The conference looked at current and experimental techniques in using adult stem cells to fight disease, specifically rare illnesses afflicting children. The April 28-30 conference was sponsored by the Pontifical Council for Culture; its foundation, STOQ, which is an acronym for Science, Theology and the Ontological Quest; and the Stem for Life Foundation, a nonprofit offshoot of the for-profit Caladrius cell-therapy company. People struck by rare diseases “are often not given sufficient attention because investing in them is not expected to produce substantial economic returns,” the pope said. “This is why the globalization of indifference must be countered by the globalization of empathy” so that resources will be dedicated to finding cures and people will be allowed access to treatment, he said. “We know that we cannot always find fast cures to complex illnesses, but we can be prompt in caring for these people, who often feel abandoned and ignored,” he said. People must be sensitive to everyone regardless of their religious beliefs, social standing or cultural background, he said. 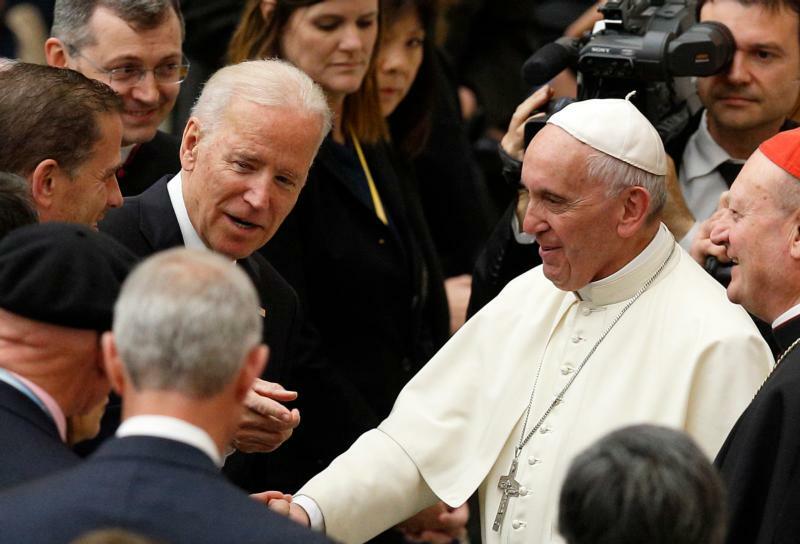 In his speech, delivered before the pope arrived, Biden spoke about the attention and comfort he felt when the pope met him and his family privately during the papal visit to the United States in September. “The Holy Father has given hope to so many people, of all faiths, in every part of the world, with his strong words and humble ways,” he said. Biden spoke about the U.S. administration’s “Moonshot,” an initiative he leads and which is aimed at eliminating cancer through prevention — including from environmental causes — and greater access to healthcare and affordable treatment. “The best medicine and treatment can’t belong only to the privileged and the powerful. It has to belong to everyone,” he said. “Cancer is a constant emergency” Biden said, as it causes the deaths of 3,000 people a day in the United States. “Why do you wait? What is your rationale?” he said. Faith, in all religions, is animated by hope and love, he said, adding that he had faith global progress was possible.